We thought we would share with you the true story of a prospective tenant’s experience when viewing a room for rent in London. 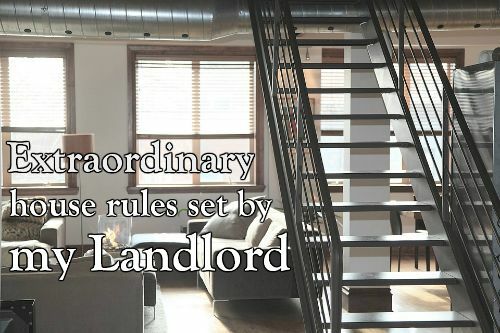 Having looked at the room she was astounded when she was handed a list from the landlord containing more than 30 house rules. Among the many rules there were “offences” where fines were levied. For example if extra heaters were used in the room there would be a fine of £100 and leaving dirty dishes in the sink attracted a fine of £15. Visitors to be approved by the landlord and two weeks’ notice in advance to be given as to their arrival, and only two visitors allowed per month. Personal items would be “thrown out as junk” if left in communal areas. The power of social media came into play when the prospective tenant, Laura Evelyn who is a proof-reader and actress, photographed the typed written list she was given by the landlord and posted it on the internet. It rapidly attracted nearly 4,000 comments on Reddit and in excess of 1,000 people retweeted it on Twitter. This story is only funny if the prospective tenant turned the room down as Laura Evelyn did and no one else is foolish enough to rent it. Landlords must give tenants a tenancy agreement and everything in such an agreement must be fair and compliant with the law. Knowing your rights as a tenant is part of what the TTV website is about and, as part of the tenancy agreement, you have the right to quiet enjoyment of the property which should always be secure and well maintained. Tenants are protected against unfair rent increases, unfair eviction and the landlord is legally obliged to return your deposit (minus any agreed deductions) at the end of the tenancy. So if you find yourself in the same position as Miss Evelyn we advise you to walk away very quickly.